Is it just me, or do you see elaborate beds on Pinterest with 857 pillows and wonder where all those pillows go at night? Or do you dream of upgrading all your bedding, but get overwhelmed with all the gorgeous choices? Back when we remodeled the bedroom, I started off the process with a dream of upgrading to more luxurious bedding. In the end, I was both out of money AND frozen with indecision when I tried to shop. Instead, I stole the duvet cover from the guest room and called it a day. I’ve looked at different sheets, duvet covers, etc quite a few times over the last five months, but always come up short. 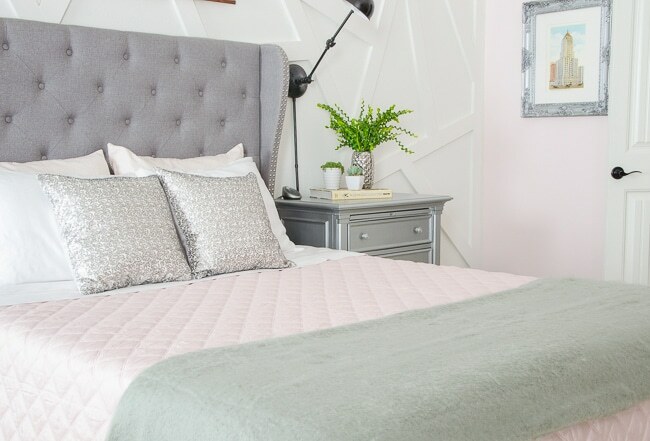 When I got the chance to work with Annie Selke, I knew it was time to get over my indecision so I could try their gorgeous bedding. Thankfully, their spring catalog was just the inspiration I needed. The theme of the catalog is ‘orglamic’ and was perfect for our bedroom. The catalog focuses on soft, organic colors with pops of glam. Right up my alley! More exciting than my own spring bedding update is that I realized it’s really simple for any of you to put together a great looking bed. Why was I making it so hard??? A three-part color scheme is the key to my simple formula. The first step is picking out three colors that complement each other and your room. I went with a blush pink, white, and gray. Any of those could have been swapped out for navy and still worked beautifully, but I wanted to go light and calming. Each color is used twice, so you end up with a cohesive look without going overboard. Color #1 is for the pillow shams and main spread/duvet cover/comfortor. I used blush pink. Color #2 is for your sheets and main pillows that you sleep on. I picked crisp white. Color #3 is for accent pillows and a throw/extra blanket for the foot of the bed. I went with gray/silver. How awesome is that pom-pom throw!?!? 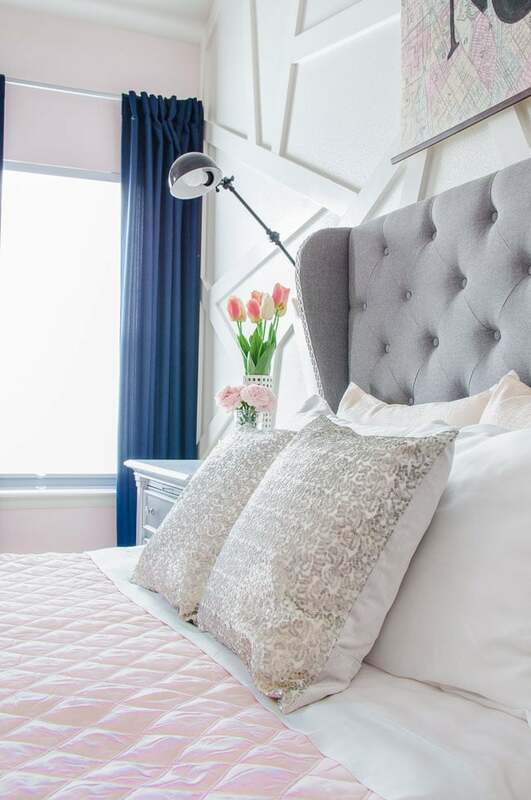 The sequin pillows put the glam in orglamic! They also provide texture to give the peaceful color scheme a bit of pop. The six components together add up to a gorgeous bed, but it still feels manageable to make every morning. 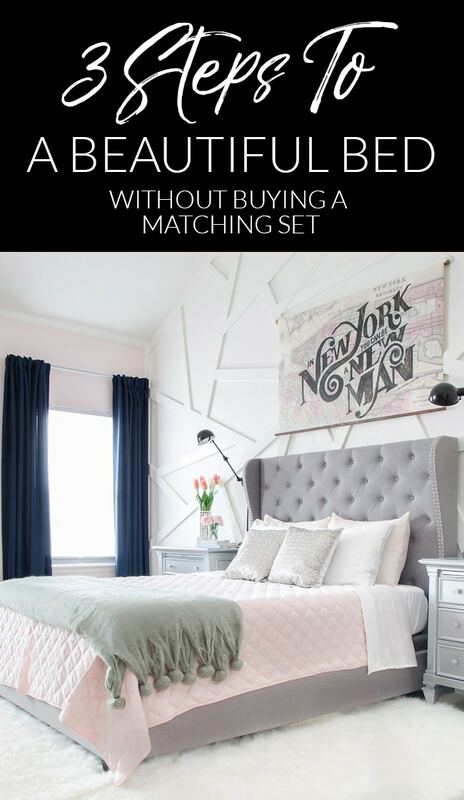 I put together some extra ideas for using my three color formula in your own bedroom. Keep in mind that you can go bolder and replace any of the colors with a pattern, they don’t need to be solid. You’d just swap out one color and repeat the pattern in its place. The possibilities are endless! You can even keep 2 colors and switch out one seasonally. Annie Selke has a great navy called Diamond Ink and I could see myself swapping out either the blush or the grey pieces with navy next fall. Now I just want to curl up in bed and enjoy my new soft sheets. They make me feel like I’m in a high-end hotel every night. 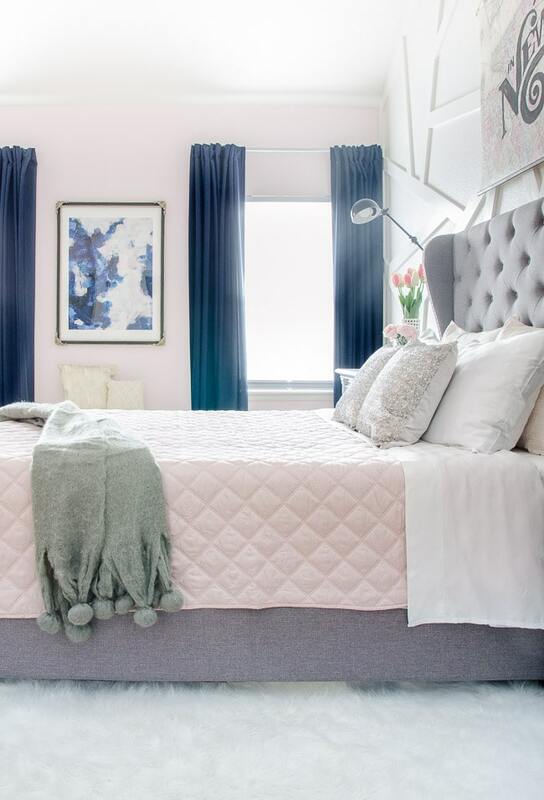 The quilted coverlet being equally soft was a pleasant surprise. After years of scrimping and saving when it came to bedding, I realized that we spend over 50 hours a week in bed. What a reason to splurge! Someone else in our house feels the same way. I left the room for 2 minutes and Maddie took over. 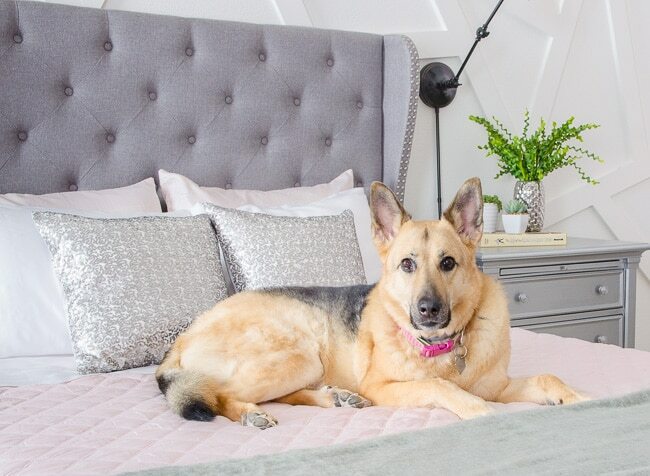 She’s a fan of cozy, soft spaces with a hint of glam too. 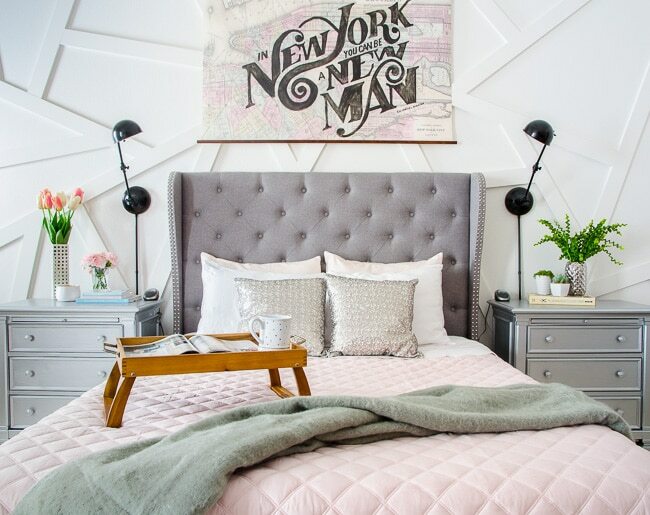 PS: If you’re looking for similar nighstands, I searched out 10 cheap mirrored nightstands here! If you didn’t check it out earlier, make sure you click over to see the Annie Selke Spring Catalog. There’s an option to sign up for the email list, which gets you a 15% off coupon. Because even when we’re splurging, we’re all about the savings! Beautiful!! 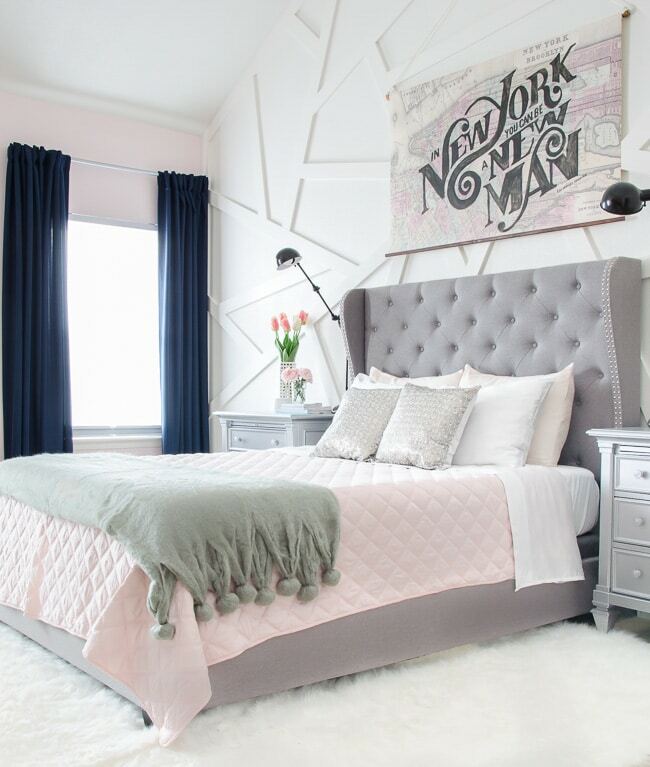 I would never get tired of looking at that gorgeous bedroom and accent wall……and you are right, we spend 1/3 of our life in bed!!!! Thank you, Sarah! It is a joy to fall into that bedroom every night! Ha – that thought is pretty darn tempting Nicole! Thank you for this post! I’ve been “frozen” for a few years now and this makes it a little easier to proceed in the decision making process! I love a formula when it comes to decorating ? Me too! I don’t have a problem breaking design formulas on purpose, but I can get totally lost when I don’t have one as a starting point. 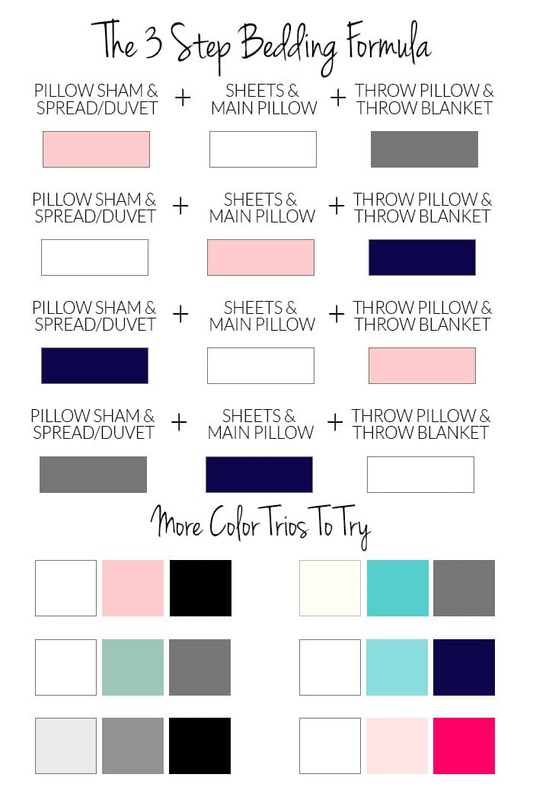 What a great formula – I always end up using the same colours for bedding and pillows. Note to self to be more adventurous! Thanks for sharing – love the greys and pinks.